NIHR Surgical Reconstruction and Microbiology Research Centre chief Professor Tony Belli has beaten his fear of heights to raise nearly £1,500 for Queen Elizabeth Hospital Birmingham. 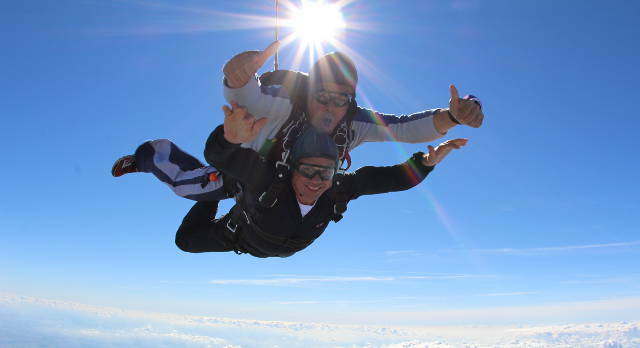 Professor Belli, who is director of the QEHB-based trauma research centre, successfully completed a tandem skydive to raise funds towards equipment for the hospital’s Critical Care Unit. He was joined on the high-flying escapade, at Hinton Airfield in Brackley, Oxfordshire, by his 16-year-old daughter Amie and her friend Will Conway. With his feet firmly back on solid ground, a delighted and relieved Professor Belli said: “We did it! And with no broken bones or holes in the ground, just plenty of fun and adrenaline! The hospital charity organised Professor Belli’s parachute jump, which was one of four held each year for staff, former patients and members of the public to take part in to raise funds for a department or appeal of their choice within the hospital. The dates for next year’s jumps are June 4, July 2, August 6 and September 10. For more information, to support patients at QEHB or to make a donation visit www.qehb.org or contact 0121 371 4852.